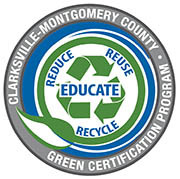 Montgomery County, TN – The Clarksville Montgomery County Green Certification Program (CMCGCP) held the second green ribbon cutting of the week on September 25th, 2018 to celebrate Heritage Bank’s completion of the Certification Program. The ceremony was attended by Clarksville Mayor Kim McMillan, Melinda Shepard of the Clarksville Chamber of Commerce, David Graham Director of Bi-County Solid Waste, CMCGCP Steering Committee member Rose Melton (Altra Federal Credit Union), CMCGCP Steering Committee member Doug Jones (Montgomery County), and CMCGCP Manager Carlye Sommers. 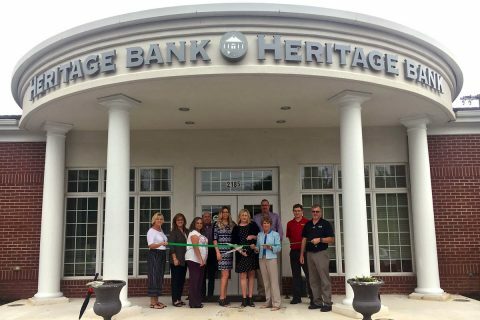 Clarksville Montgomery County Green Ribbon Cutting for Heritage Bank. 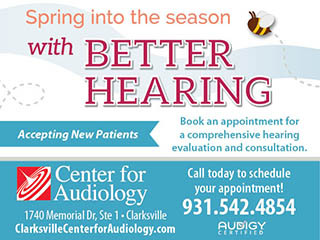 (L to R) Melinda Shepard, Rose Melton, Barbara Clifton, David Graham, Amber Empson, Kasey Bright, Mayor Kim McMillan, Doug Jones, Chase Clark, Scott Sandridge. Heritage Bank, which began the Certification Program earlier this year, had already actively recycled white paper. After going through the Program, Heritage Bank expanded its recycling to include all recyclables such as plastics and cardboard. Kasey Bright, a Heritage Bank Customer Service Representative, explained how the bank has worked to keep lights off in unused offices, and added programmable thermostats to reduce energy use. Customer Service Representative Amber Empson added that the bank also donates used printer cartridges to the Humane Society and newspapers to Precious Friends. Mayor McMillan congratulated the employees on their hard work and dedication to the Program and asked if these green practices were also taking place at home. Mrs. Empson confirmed the employees have increased recycling at home and occasionally bring their recycling into work for disposal.